Everyone needs an easy and elegant option for a special occasion dinner – this gorgeous Pork Tenderloin with a peppery crust and simple pan sauce is one of the most requested for birthdays and celebrations at our house. My recipe for Pork Tenderloin with Sauce Poivrade is just the thing when you have company, too, and it’s easy enough to knock out on a weekday. The Sauce Poivrade sounds almost too simple to be true, but it’s a rich, velvety sauce just full of classic flavors. Heck, a quick glance at the ingredients might have you wondering, but ya gotta trust Thomas Keller. I hafta say I wondered myself when I saw red wine vinegar and jam and then when I got to the cornstarch I was a bit taken aback. I think I have an idea that anything with cornstarch is going to be like a cheap diner gravy but in the hands of a master chef (that’s you, now, and me, too, when you make this, lol) it works beautifully. When you serve Pork Tenderloin with Sauce Poivrade you can go with a classic pairing of a good mashed potato and a green veggie like my Simple Steamed Broccoli or Brussels Spouts (I love my Bacon Brussels Sprouts with this dinner). If you want to get a little fancier and serve something a bit different, try my rich, silky Pureed Parsnips. The parsnips have a sharper flavor that plays off the pepper in the Pork Tenderloin with Sauce Poivrade. Cauliflower does the same thing, so if you want a healthier option, try my Parmesan Cauliflower Mash or Instant Pot Cauliflower Rice. And hey, you won’t go wrong with a wild rice mix, either if you’d like to go that route. The recipe for Pork Tenderloin with Sauce Poivrade is pretty straightforward. The only piece of advice I can think of is to use a meat thermometer to get your pork to just the temperature you’d like. It’s safe to cook pork from a rarer 145 degrees on up to 160. Oh, and if possible, use freshly cracked black peppercorns for this recipe. If you use powdered pepper you won’t have the same results, but just fyi, you need a fraction of the amount of powdered as freshly cracked. Use about a pound and a half of riblets (from the butcher or save your bones when you trim ribs or pork chops), roast until brown (a cast iron skillet is great for this) at 425 degrees. Remove and simmer with 2/3rds cup of water, scraping up drippings and stirring to extract as much from the bones as possible, simmering until water is nearly gone. Do two more reductions. The first reduction, add 2 cups demi-glace and reduce to 1/2 cup. For the second, add two more cups of demi-glace and reduce to one cup. Remove and discard the bones. Continue with the rest of the recipe. In the past, we often went out for special dinners, but it’s become harder to justify when you can put a delicious, restaurant quality dinner on the table for less than the cost of one plate when eating out. This complete dinner for four (if you’ve shopped well) is about the same cost as the premium meals (burger, fries, drink) at McDonald’s. 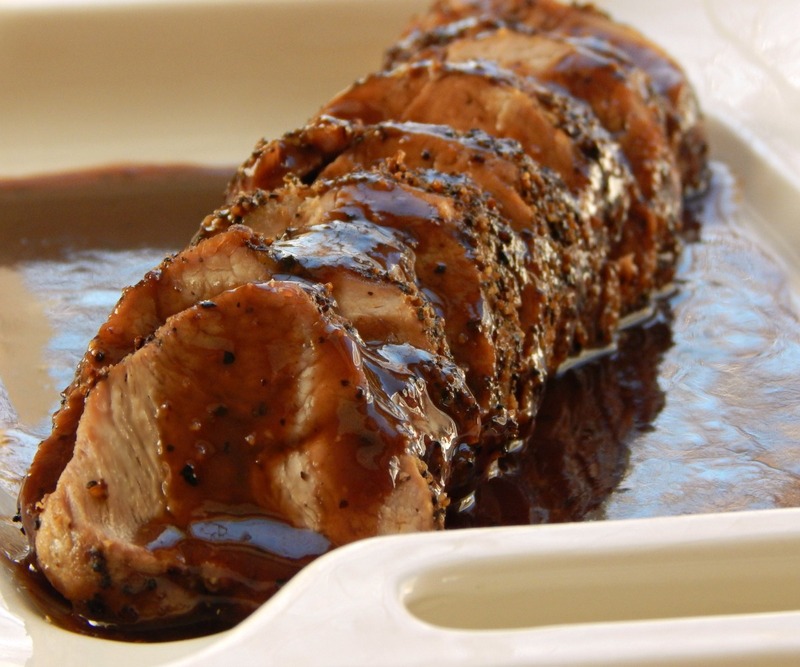 Pair Pork Tenderloin with Sauce Poivrade with lots of budget sides for a reasonably priced meal. Leftovers, if any, can be thinly sliced and made into sandwiches, especially if that sandwich is something like a Cubano that relies on things other than just a few slices of tenderloin for heft. Eaking a second meal out of a first, more expensive one is one of my strategies to stay in budget, although tenderloins, to be honest, are not huge and at our house, with this meal, nonexistent! 1 teaspoon of cornstarch dissolved in about a tablespoon of water. Rub tenderloin with salt and freshly cracked black pepper and sear in hot pan with olive oil. When browned on all sides, remove to a small ovenproof dish (set the pan aside off the heat for the sauce) and bake tenderloin until a thermometer reaches 145 (pink in the middle) to 160 degrees in the thickest part, about 25 minutes or so for pork cooked as shown in the photos. Remove and tent with foil for 10 minutes. After the tenderloin is in the oven for about 15 minutes, in the pan you seared the tenderloin in, add 2 cups of chicken broth, the jelly, and the red wine vinegar. Bring to a boil and reduce to about one cup. Taste, stir in cracked pepper as desired. If serving children, keep the heat level in mind when you add that pepper. Stir in the cornstarch mixture and simmer a few minutes to thicken. Taste and add salt if desired. Keep warm. Slice tenderloin thinly on the diagonal. Mix any accumulated juices into the sauce. When serving, serve three to four slices per person, drizzle a bit of sauce over each portion and pass the rest of the sauce. Notes: The best results will come from using a home-made or really good quality chicken stock and the Currant Jelly, which is not as sweet as most jams/jellys. Substitutions can be made, but try to stay with a good quality dark jelly or the sauce will really be sweet. Nutrition, Per Serving: 229 Calories; 10g Fat (39.7% calories from fat); 26g Protein; 8g Carbohydrate; 1g Dietary Fiber; 74mg Cholesterol; 366mg Sodium. Exchanges: 0 Grain(Starch); 3 1/2 Lean Meat; 1 Fat; 1/2 Other Carbohydrates. Tonight, I’ll be linking Pork Tenderloin with Sauce Poivrade up to Throwback Thursday, of which I am now (Yay!) a cohost! Stop over and see all the great recipes and party ideas and check out the other co-hosts, too: Quinn of Dad What’s for Dinner & Alli of Tornadough who started it all and Meaghan from 4 Sons are Us. See ya there! I’m also dropping by to Angie’s Fiesta Friday! I’ve already seen some of the great recipes featured there this week! Wow! Thank you, Angie, for putting on this extravaganza! She’s been hosting for 93 consecutive weeks! Helping her out this week are Jhuls @ The Not So Creative Cook and Kaila @ GF LIfe 24/7. I’ll bring this by to Freedom Fridays, too, hosted by Love Bakes Good Cake (that’s so true, isn’t it?) She’s teamed up with My Turn for us and With a Blast to bring you the best “no rules” party around! I’ll also be linking to Saucy Saturdays No 19 – a food and craft link party!! This entry was posted in Click here for Bargain Meals, Click here for Fabulous Food Posts and tagged Bargain Meal of the Week, Beef Stock, Chicken Stock, demi-glace, French Laundry, Jam Jelly or Preserves, Pork, Pork Tenderloin, Thomas Keller, Vinegar. Bookmark the permalink. Pinning this so I have for later, looks very good and I want to try it soon, thanks for sharing! Beautiful – and so easy! Thanks for reducing the recipe to its essential (and for still making it look absolutely stunning!)! Thanks, Mr. Fitz! Why say in 10 words that which will fit into several paragraphs?! aargh! Thanks Auntie Juj! 🙂 I’m going to pop over and check it out! Hi Kaila, and thanks much! And happy FF to you!! That does look like a very special meal. It looks so delicious and gourmet. What a great recipe! Thanks Carlee. This is my kind of recipe – it looks all fancy but really there isn’t much to it when you think about the few ingredients and steps. Very happy I found your blog. So many inviting recipes. This is one I will definitely try here soon. And thanks for stopping by mine, anticsincooking. This one is, I think, of all my recipes, one of my very favorites and seems so fancy for very little effort! I enjoyed your blog, too, although I’ve only started leafing through it. Your Mom’s apple tart looks fun and delicious!